Who doesn’t love white? Especially in flowers. Always elegant and classic, it is certainly the most requested colour scheme not only for weddings, but also for most design work. And throw in some chartreuse, yummy! I would always advise customers at the flower shop when they were not sure of a colour for a gift arrangment, to go white. As a neutral, it is suitable for any home, and people have much stronger opinions about colour, white is certainly a safe choice. My friend happens to love white and green, smart woman, so when I was visiting her in Toronto, it was off to pick up some white and green flowers to prepare an arrangement for her coffee table. I have already showed you the hydrangea arrangement we made for her front hall, and we had some extra Limelights left and more hostas, so we lined this vase as well. I love lining vases, when I worked at Kenneth Turner, all our clear vases were lined, we used to use a flower frog made out of chicken wire to hold the flowers in place. But when I worked at Black Eyed Susan’s, we taped a grid on the vase after lining it, much easier on the hands. Grouping flowers is the big trend in the floral design world now, so I added my hydrangea in two groups of two. When you are grouping larger flowers it is not as important to add them in odd numbers, however I would never put just two roses together, so they were added in groups of 5 and 7. Commercial chrysanthemums and alstromeria completed the white flowers, while green hypericum berries brought in a fresh shot of green. And that green Wasabi coleus, talk about yummy, I loved it, and it was cut fresh from the garden. Perhaps a bit too fresh perhaps. The next morning we found small puddles of water on the surface of the tray and could not figure out where they came from. Imagine our surprise, when we discovered new ones later that day. How was this happening? Looking a bit more closely at the arrangement we discovered this. I have been a floral designer for over twenty years, and had never seen this before. Has it happened to you? August 16, 2012 · Filed under design, flower arranging	· Tagged Athryium 'Ghost', flower arranging, Hosta 'Sum and Substance', hydrangea "Limelight"
Who doesn’t love hydrangeas? When I was working in floral design, it seemed to be the one flower that customers and designers always wanted to include in arrangements. And with good reason, it is classic and elegant. I was staying with a dear friend for a few days and we decided to make a couple of flower arrangements. I was surprised at how much I missed flexing my ‘design’ fingers. After the coffee table arrangement was completed, her amazing garden was raided, and the Limelight hydrangea was just asking to be used. After lining the crystal vase with blue hosta leaves, three chartreuse ‘Sum and Substance’ hosta leaves anchored the base, before it was filled with the Limelight hydrangeas. A few fronds of ‘Ghost’ fern added more texture near the bottom. I have always loved large arrangments in a front hall or a dining room sideboard, not only do I think they look dramatic, they are one of my favourite to design. Please, please, walk this way Mr.Plumber. See the path, Mr. Electrician? Do not go to the back door, you might see a scary, overweight lady, standing in her knickers, making a cup of tea. One of the annoying things about the way the house is laid out on the lot is “people” coming to the back door, the kitchen door to be more precise. And it is glass!!! 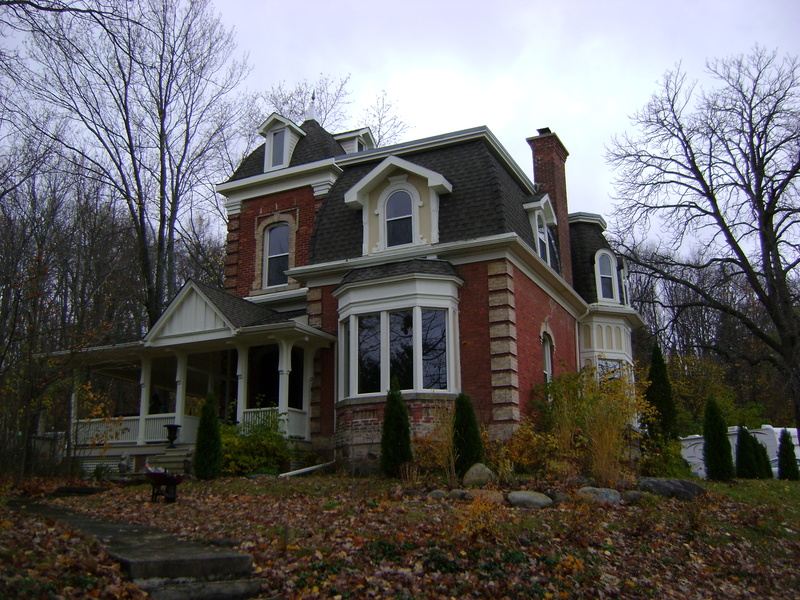 When Kilbourne Grove was originally built in the late 1800’s the road that runs beside the house was the driveway to the stable, behind the house, and the front door, faced the street, 250 feet away. 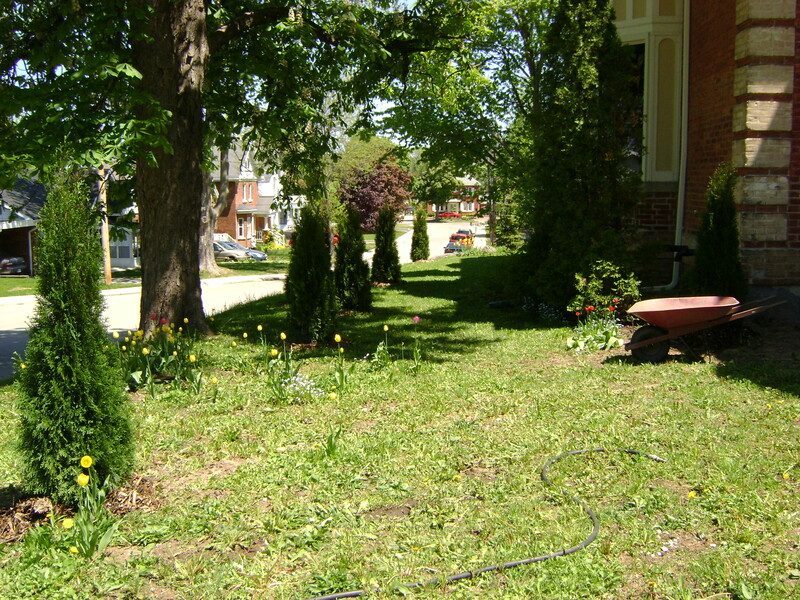 Over the years, the front yard was sold off piece by piece, until there is only 20 feet separating our front door form the side of the neighbours house. When people pull into our driveway, it is logical for them to go to the back door. 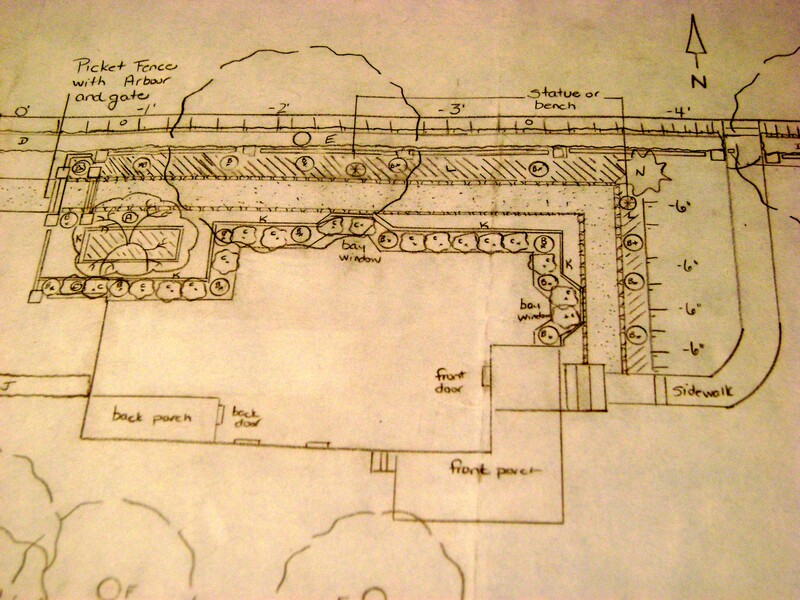 When I took my garden design course last winter, we had to come up with a client and design a garden for them. I decided to pick myself (after all, I am a very easy customer), I was taking this course for my own benefit, not to change my career. Since it was a very short course, and I have a large garden (not as large as some, but I intend to landscape every square inch), I had to choose an area to focus on. I chose to work on the side yard. This is the area that would bring visitors from the driveway to the front door. I need to block off the view of the kitchen and back door, and a fence will be built linking house and garage. Then a path, leading from the driveway, along the side of the house, turning south at the end to the front door. This is the plan that I drew for my teacher. None of gardens south of the house are on, this part took forever to draw! Ok, I should have taken a picture of the legend, but I can walk you through it. You enter from the driveway (left on the diagram), through an arbour, and walk along a pea gravel path. On your left (top of the diagram) is a row of Emerald cedars (B), underplanted by European ginger(L). On your fight, a row of Limelight hydrangea(C), with a boxwood hedge(K), this is also underplanted with ginger. You walk to the end and make a sharp turn to the right. I am thinking about having another arbour here. I also am adding a bench here, for those of you to tired from the long walk to the front door. The rows of Emerald cedars and hydrangea continue all the way to the front door. N on the diagram was the blue spruce that Ian and I moved. Its story is here. 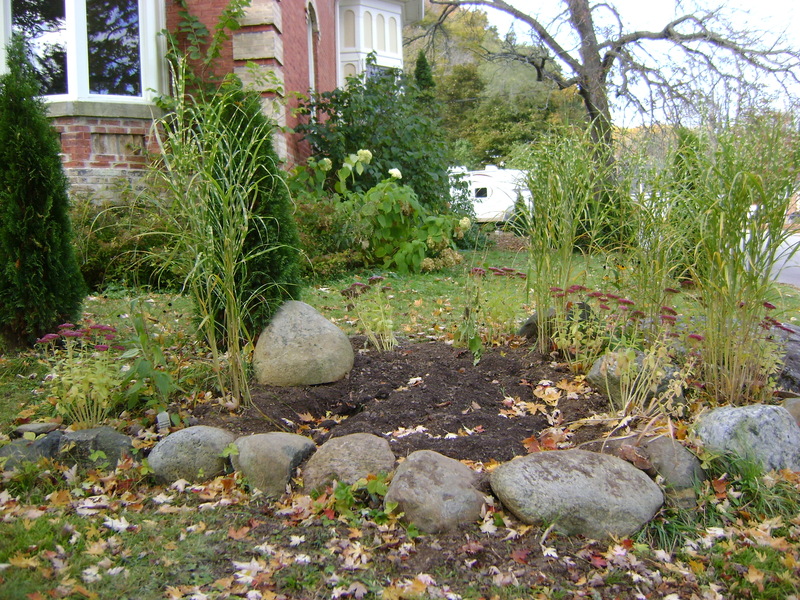 The rectangular box near the entrance arbour is another small garden. As the house is indented here, but I wanted the path to stay straight, this gave me room for a planting bed. 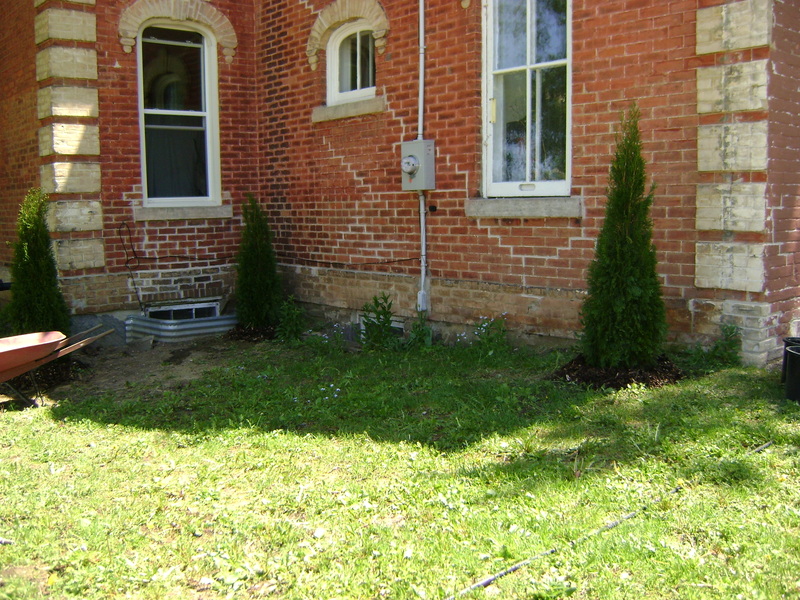 It will also be edged with box, and a specimen tree(A) will be planted here. A magnolia, redbud or perhaps a dogwood. There is a picket fence running from the house, north towards the street, along the path to the property line on the east, with a gate at the front sidewalk. You might notice a gap between the fence(J) attaching the house and garage and the picket fence. This is where the greenhouse will be built. (One day). We have already started on this project. 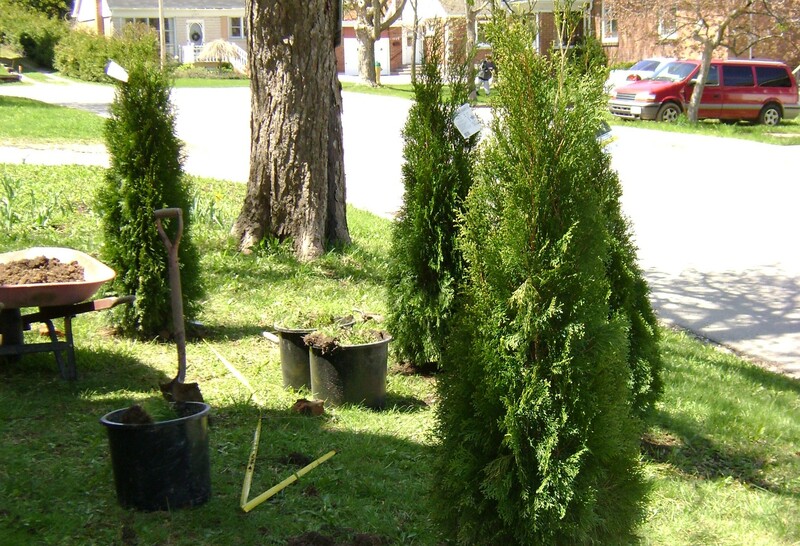 The line of Emerald cedars on the north or street side of the garden. The tulips were there when we purchased the house. The developer had sodded over them. I was very surprised when they came up in the spring. Here you can see the indent, where the old kitchen wing is narrower than the main house. 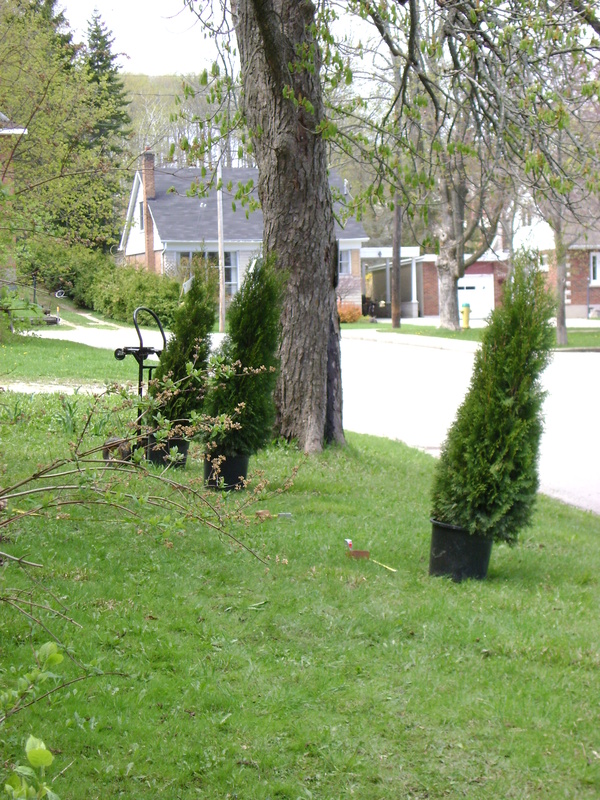 There is nothing between these cedars and the street, hopefully they will give us the illusion of privacy. A planting plan is always fluid and open to change. When we were planting these, I changed it slightly. The cedars had been so cheap ($20 each) that I decided to make a bit of a niche, bumping it out to match the bay window in the library. This can be used for a bench, or perhaps some container planting. This is where the second arbour would go. Right behind those grasses, and in line with that white trailer. That is not ours, it is our next door neighbours, we are storing it in our driveway for the winter, in exchange for him snow blowing the drive, yay! Sorry, Edith, about the rocks, they were there when we purchased, and have not been moved yet. Talk about someone just lining them up! I am hoping to have a stacked stone retaining wall built in the future. Seen from the other side. That big rock is natural, it would have to stay. And from the street. See how the line of Emerald cedars marches along the side of the house. The retaining wall would start at the left at the sidewalk and follow the curve of those lined up rocks and end at the big buried rock. Next, would be digging out all those very old, and very large shrubs beside the house, so the hydrangea and the other row of cedars can go in. I can feel my back ache already. Wow, Susan Meisner and Tom Brown have made an magnificent garden, the culmination of their lifes work. I am sure that it has to be one of the largest, private gardens to be developed in the last few years. Tom, a retired architect from Toronto, led us on the garden tour. There is 80 acres, of which 5 is gardened, and they started their garden in 1996. They both have a huge work ethic, they must have, the progress they have made in the past 13 years is immense. Tom says that he moved 400 tons of stone by himself, building all the stones walls and paths. The garden is called Spindletree, due to the number of Euonymous europaeus, that were on the property when they bought it. When we visited, there was a few garden features that were not on the garden map. A 300 foot locust allee has been planted, with the Victorian Well Cover as the focal point at one end. On the other end, Tom and Susan are planning on a huge glasshouse. A cedar maze had just been planted, and was due for its first haircut. And there are more plans for the future, including a fern grotto. I hope that I don’t bore you with so many pictures, but I was blown away by their garden. 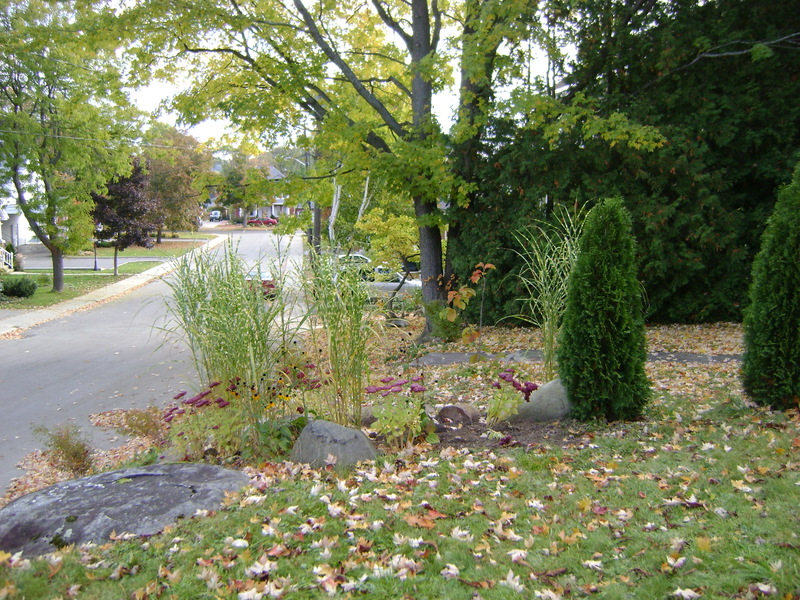 It has a European sensibility, which is rare in Canada, formal gardens are unusual in the country. The combination of formal, very structured garden near the house, moving into an English park like setting was magnificent. They have developed 5 acres of amazing garden, divided into a series of gardenrooms, all with their own theme. Tom took us on an hour and a half tour, full of interesting stories and helpful tips. From the tan pea gravel imported from Montana, to the wooden croquet hoops, built to look like landmarks in England, there was so much to see. Lovely statuary! 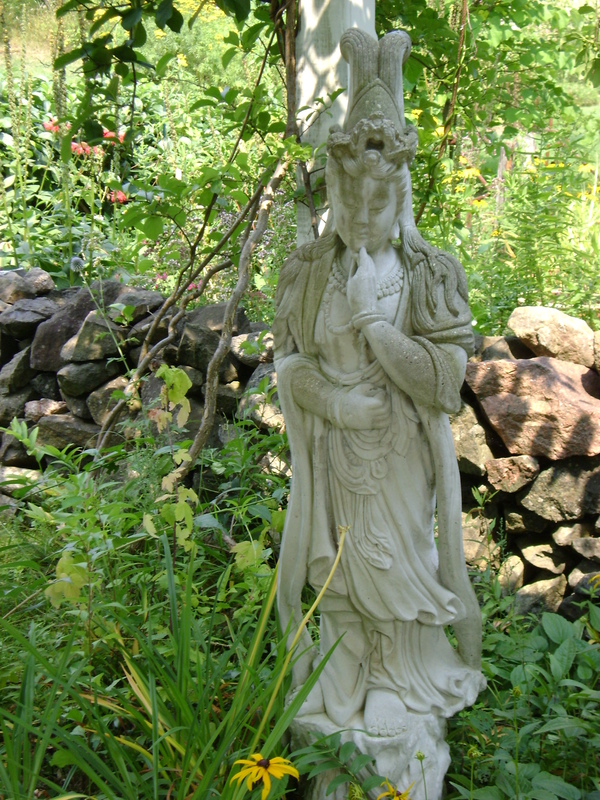 This is Kwan Yin, the compassionate goddess of the garden. 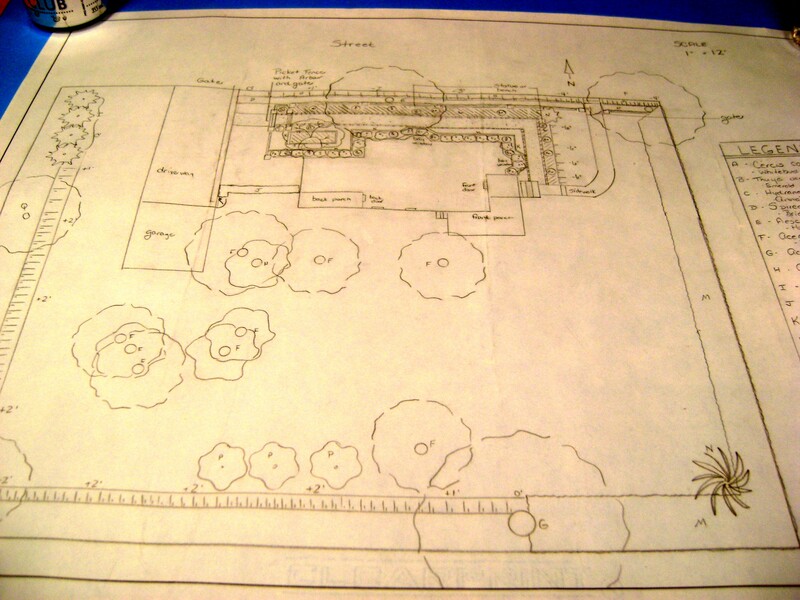 I just found the most amazing garden design blog. Deborah Silver is a very talented garden designer. She says its “Dirt Simple”, but I would have to disagree. Every garden she designed I loved, but I especially loved hers. The fountain that is in her header is in her own garden and it is lovely. I can just imagine coming home after a hard day at work and sticking my feet in. And if someone is pouring the drinks, even better! I took a garden design course at George Brown College, last fall, and my project was to design a new walkway to my front door. When our house was originally built the front lawn went all the way to 4th Av W., and a laneway ran on the north side of the house to the stables behind. Over the years, the laneway became a street and the owners sold off bits and pieces of the land, including the portion in front that went down to the street. This means my front door is facing my neighbour with the garage behind the house. Everyone that visits comes to the glass back door. It is quite disconcerting to be standing in your knickers and hear a knock on the door, (and not only for me!). I need to make an inviting path that will lead all the way from the driveway, along the side of the house, to the front door, and make an uninviting and unnoticeable entrance to the back door. In my garden plan at college, I designed a peagravel path, edged with a boxwood hedge. There were Emerald cedars spaced rhythmically along the path, and between them was Annabelle hydrangeas. I chose the Annabelles, as there were 4 or 5 already planted beside the house and they were quite happy. That is until I read an entry on Dirt Simple. Deborah had a similar hydrangea and boxwood lined path, but she used Limelight hydrangea instead of the Annabelles. It look amazing!!! I actually went to the food terminal in Toronto today, and bought 2 shrubs. I am going to plant them against the house and trial them for a year, Deborah says they are very easy to grow. We have already planted some of the Emerald cedars on the north side of the path. The south side still had the original shrubs in it, 10 foot tall mockorange, the Annabelles, a struggling forsythia, and some spirea. These will be a battle to dig out as they have been planted longer then I have been alive. Hopefully, next summer I will have made some progress on this and will be able to share it.